I was beyond thrilled when I found The W.G. Creole House 1850 on Hotels.com. My partner and I had been looking for a place to stay and several expensive Airbnbs we liked were booked literally while we were making a decision. We were hoping to find somewhere affordable and safe (and I was hoping it would be pretty, as well). I snapped up the last room that was available on our trip dates before I even realized that we'd be sharing a hall bath. We are both familiar with hostels and that didn't bother us, especially since we were only going to be sharing with the occupants of one other room. I loved the look of the rooms and lobby. We were further pleased when we learned that the proprietor would be texting us the entry codes and other information, so it wouldn't even be necessary to formally check in. The room was lovely and the person we texted with was always very accommodating and let us keep our bags on the property during the day we checked out so we wouldn't need to lug them around the city. During the four days we stayed, there was only one time that we needed the hall bath that the other guest was using it. I only saw other guests for a few minutes on the day of our checkout. The hotel provides towels, shampoo, conditioner, and body wash, as well as coffee, tea, and a place to toast your bagel. The neighborhood isn't posh, but it is perfectly safe, quiet, and near a couple nice restaurants, as well as two streetcars. Definitely recommending this hotel to friends! Gorgeous place to stay and it was super quiet I loved the feeling of having the whole house to ourself! The room we stayed in was the executive and it was exquisite loved the bathroom and beautiful but simple decor it was a dream to stay and would definitely stay here again if we go back to NOLA! 🙏 Manager was very communicable and answered any questions that we had and very nice! I booked the Creole House through Expedia. Gayl contacted me ahead of time to give me the codes to enter the house and my private room, and the WiFi password. Speaking of which, it was nice using codes to get in and out of the house, instead of worrying about keeping track of keys. The room was very clean, with several towels available for use. The room also had a mini fridge. Although the bathrooms are shared, it was right next door to my room, which was very convenient. I also liked the location of the house. It is two blocks away from St. Charles Street, and about a 20-25 minute walk from the French Quarter. Yes, it does get dark at night, but since I also live in a big city, it wasn't an issue (nobody bothered me at all). Overall, my stay was very pleasant and I highly recommend this guesthouse. Stayed in this quaint 1850 house in Morristown, Vermont. Great location, clean & comfy. Our room had a bathroom & shower in the room. The other rooms shared a large bathroom. We had access to a fridge, microwave, & coffee. Close to Stowe which was our main attraction. Lots of great restaurants & pubs close by. Foliage was spectacular, also just a short ride to Montpellier, Vt. Which is a cool town to explore. The downside I guess this property: would be considered to be a guesthouse. There was no housekeeping services provided. Towels not changed, beds not made, garbage never removed from our room We ran out of toilet paper and bought our own. We NEVER saw the proprietor. (We had prepaid for the room for the entire stay several months prior) for the four days that we stayed at the property Make your own coffee in the common area the kitchen on the first floor. Since our room was located on the second floor, and given the number of steps one had to navigate to get to said room, could be a challenge or simply impossible for one to carry such an item upstairs. The upside but for some the first thing I will say may be considered a downside for others. The party who designed their website embellished the pictures. The pictures of the inside of the property were as is but NOT the pictures taken of the outside. The neighborhood is extremely run down. The street was quiet though given the fact that it is located one block from the US 90 I 10 overpasses. You will encounter a number of homeless people if you walk to downtown that have pitched tents on under the (19 US 90 overpasses. There is some limited on-street parking available that is free and for a big city that is a huge plus. If you are planning to drive/rent a car while in New Orleans and you choose to stay at 1850 Creole House, I would suggest that you rent a car from Enterprise . They have a rental facility about a 2 block walk. You will pay more to rent a car from them, but they will permit you to park your car in their lot overnight free of charge. The gates close at 6:00 P.M. and reopen the next morning at 7:30 P.M. Saturday and Sunday opening and closing hours may be different Nice insurance policy given the limited on street parking and two, your rental car will be much more secure. The St Charles trolley is a near by walk, if you plan on going downtown or somewhere along the Garden District. There are two restaurants on Clio open for dinner with some other options on nearby St. Charles. If your driving, you will find restaurants that offer ample free parking on St Charles. The average rating is therefore based upon customer service TERRIBLE (none) Location and Price EXCELLENT. We had a wonderful 7 night stay at W.G. Creole House. Everything was very clean and comfortable. Great king size bed in the downstairs bedroom with private bath in the hall just outside the door. Room had separate A/C + heat control which worked great in the 36C heat. The area outside the house looks a bit sketchy but we had NO trouble and felt very safe. You are about 1.5 blocks from St Charles St. and you pass 2 restaurants on your way there, just go out the front door and turn right. When you reach St Charles you will find the Street Car stop on your right, a bit down the street by Popeye's and Wendy's. Keeping walking and you will find many restaurants, pubs and a Walgreens for anything you need. We walked to the WWII museum in about 10 minutes and used Uber to get to the French Quarter and waterfront, it averaged $6. It's 3$ for a 24hr Street Car pass just have 3 seperate 1$ bills and insert in the machine as you board it will give you the pass. You can ride it to the end and back for a great view of the many Mansions along the way or up to Canal St where you can walk easily to Bourbon or Decatur Streets. The house is basically self serve, if you need a front desk, your bed made daily or new towels everyday this is NOT the place for you. However if you can go a few days with 2 full sets of towels and a well stocked bathroom you will be better than fine!! Lots of hotwater and you can drink the tapwater its very good!! We had 2 bottles of water in our fridge and just refilled them. We were contacted mid stay to see if we needed fresh sheets and had our towels changed out and bathroom restocked. Make sure the owners have emailed or texted you the door codes before you arrive. Text or email owner for any help but things should be very smooth. We had an in room fridge with a small freezer but you can use the large kitchen fridge which has an icemaker. The kitchen has a coffee and tea area toaster and microwave the Stove however is not for use. Plastic utensils, napkins, cups and paper plates are provided. This was a fantastic quaint getaway. We had a quiet house without the bustle and crowds of a hotel. All amenities were supberb. Everything was clean. Room was large. We would stay here again. It was close for walking or taking the trolley. We loved it!!! We came down for a four day trip, and the room was perfect for our needs. It was nice and quiet while still close and easily accessible to everything we wanted to do on our trip. 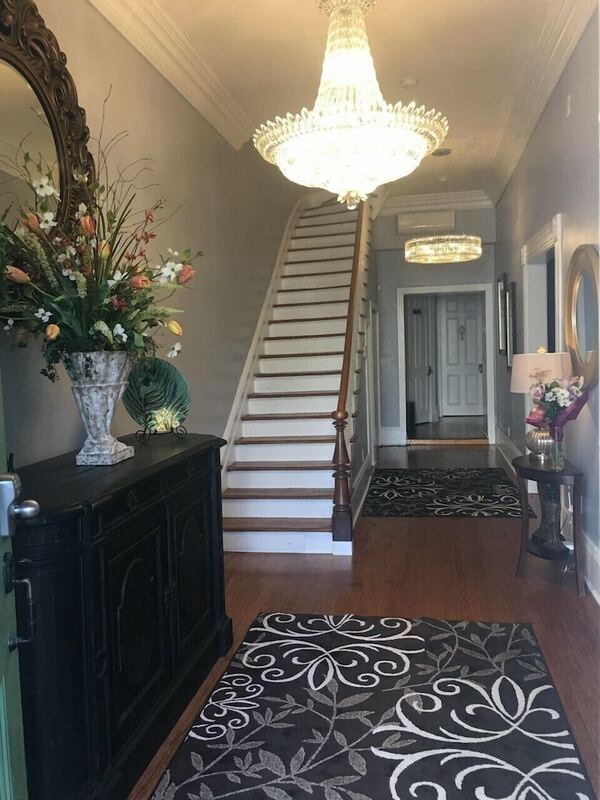 The high ceilings and chandeliers are absolutely gorgeous, and the soft music playing in the room off of the entryway was such a nice and relaxing touch. The outside surrounding the building is deceiving to the beauty just inside the front door. The owner was very responsive and accommodating, especially since our flight itineraries didn't match up perfectly with the check in and check out times. About a week before we arrived, the owner called to check in and give details about our stay, which was a great personal touch. Couldn't ask for a better place to stay that is clean, quiet, and beautiful! We came in for a conference with other Harvard University graduates. The price for the property was so amazing we couldn't resist the temptation to book. When we arrived we couldn't have been more thrilled by the local flair and grandeur of this historic property. The property was built at some point during the 1850's and has been beautifully restored. The chandelier in the main entrance sparkled with such magnificence. There were also fresh cut flowers which added to the beauty of the place. The rooms were quite large. There we other rooms in the house with private bathrooms but we booked the one with a shared bathroom and hardly ever saw anyone else there. Plus it was much cheaper to book a room with a shared bathroom. Rooms with private bath are more expensive and we were on a budget. The kitchen was well stocked with coffee and tea and condiments. There is no breakfast and they state that on their website. Plus we wanted to try out the local food anyway. The sheets were very nice and the whole place was clean. We couldn't have asked for a better place to stay and the price was a amazing! We were a little concerned about the complaints of homeless people in New Orleans so we wanted to comment on that as well. We were a little concerned at first about the homeless people issue that a couple of people brought up in their reviews. Once we arrived we noticed their were homeless people on every corner of every street in the entire city of New Orleans. We have lived in big cities all of our lives and this is like all the others with this issue! So no matter where you stay in New Orleans you will see this phenomenon good or bad. So anyone unfairly judging this property because of the homeless issue is an imbecile. We have found our new home away from home to stay when we come back to New Orleans. The W.G. Creole House 1850 places you in Central City, within a leisurely stroll of popular sights such as National World War II Museum and Magazine Street. The 4 rooms at this 3-star guesthouse include refrigerators and TVs. A TV comes with satellite channels, and guests can stay connected with free WiFi. Other standard amenities include a refrigerator, a ceiling fan, and a desk. The W.G. Creole House 1850 features free WiFi in public areas and a terrace. Staff members can help with accommodation requests, and provide luggage storage. The nearest major airport is New Orleans, LA (MSY-Louis Armstrong New Orleans Intl. ): 20-min drive, 15 mi/24.2 km.